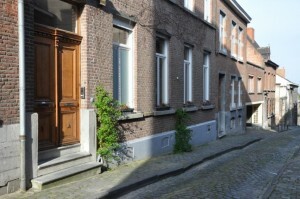 We live in one of the oldest street of Mons, a pretty narrow street made of cobblestones. The house, an old “maison de maître”, is located a bit before the top of the street, on the left side when going down. The front door, a large double door, gives access to the newly decorated entry hall. On the right of the front door, a scallop-shell shows that the house is a special stopover for the pilgrims to Santiago de Compostella. Crossing the entry hall will get you to the kitchen, a very new, large and modern kitchen specially made to offer a practical breakfast corner and all facilities to prepare the meals for the guest-tables. A large bay-window is illuminating the kitchen and gives access to the garden. The garden, a small and quiet haven in the very center of Mons, includes a wood terrace overhanging a small pond. A cubical metal structure gives a bit of shade sometimes welcomed in that charming garden decorated with an harmony of white and green. A beautiful wisteria decorates the back side of the house while giving a wonderful scent during the spring period. Parking : it is impossible to park along the Rue des Compagnons. Nevertheless we own a parking spot, closed to the house, that we can offer to our guests.